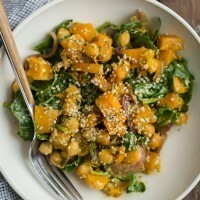 Butternut Squash Salad with Hemp Dressing | Naturally.Butternut Squash Salad with Hemp Dressing | Naturally. Preheat oven to 400˚. In a roasting pan, toss together the cubed butternut squash, sliced onion, olive oil, chipotle powder, and salt. Spread into a single layer and bake for 20 to minutes, until the squash is tender and onions are just starting to brown. Remove from oven, stir in chickpeas, and return to the over for another 5 to 10 minutes until the chickpeas are warm. Remove and let cool slightly. While squash is roasting, combine ingredients for the dressing in a (high-powered) blender and run for 30 seconds, until the dressing begins to smooth. Pour into a container and place in the refrigerator until ready to serve salad. Combine spinach with butternut squash mixture in a large bowl. Drizzle about 1/4 cup of the dressing over and toss until salad is well coated. Serve salad with extra hemp seeds and dressing as desired. + This dressing works best using a high-powered blender but can be done in a regular blender- the seeds will just stay slightly larger chunks! + Dressing adapted from Oh She Glows.